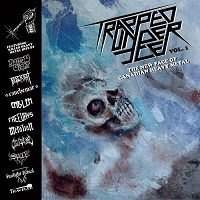 Just when you thought Canada couldn’t get any better, Temple of Mystery Records releases TRAPPED UNDER ICE VOL. 1: THE NEW FACE OF CANADIAN METAL. This compilation is a cornucopia of metal and showcases everything from black to thrash. There is sure to be something to satisfy every listener. TRAPPED UNDER ICE is prime sampler platter to sink your teeth into and we have Temple of Mystery to thank for the release. Starting off we have TRAVELER playing traditional heavy metal with “Betrayer”. Which offers kickass vocals and razor sharp riffs. METALIAN are a thrash blast from the past with a modern production. The best part of this compilation is there are no commercial sounding bands. Real metal for metal heads. CAUCHEMAR released a rather by the numbers tune with “Comme un Poignard”. It’s a good song no doubt, however just very straight forward. OCCULT BURIAL’s “Fight for Survival” is a short and sweet, black and roll jam. Raw but works to their advantage. STARLIGHT RITUAL pay homage to 80’s cult film “Demons” with a song of the same name. This could have easily been in the movie! It is very much a kickass, rocking thrash tune with vocals that sound eerily like Neil Turbin formally of Anthrax. One of the highlights of the compilation to be sure. FREEWAYS form of traditional metal also sticks out on “Heavy Rescue”. Balanced, yet has elements of Iron Maiden and Thin Lizzy. BARROW WIGHT also slay with their brand of fuzzy, dirty, raw metal. “Morgûl Blade” is a boozing good time that has the same effect of a rumbling freight train coming at you. Some comparisons to VENOM can be made to BARROW LIGHT, however they bring the thunder in their own style. SPELL have a very unique sound. “Silent Towers” has lots of variety, but mostly sounds slightly progressive with a mix of Blue Oyster Club and Death. BLACKRAT play a second wave of black metal mixed with Celtic Frost and God Dethroned. “From the Tideless Sea” should not be missed. EMBLEM’s “Fast Rocker” is a short and sweet tune alá Judas Priest. Great traditional metal that is memorable. TRAPPED UNDER ICE VOL. 1 is a kickass compilation that does not ease up in speed and black metal. This metal buffet will cater to metalheads of all backgrounds. This compilation counters the idea that rock is dead and Canada is a breeding ground for quality music. Maybe it is the weather and climate that brings out the permafrost in these bands? This record is for fans of thrash, speed, and black metal. Outstanding compilation that will put many in a party mood!